Mono Headphones, sometimes referred to as Monaural or Monophonic headphones, transmit a single sound signal over a single channel. Mono Headphones should be used with mono sources such as cassette player/recorders, record players and many listening centers. Using mono headphones with a stereo source can cause poor sound quality or equipment damage. Stereo Headphones, or Stereophonic headphones, transmit two sound signals over two separate channels, providing a more natural, "three-dimensional" distribution of sound. Stereo headphones should be used with computers, televisions, CD players and other learning tools with a stereo output. Using stereo headphones with a mono source can also result in poor sound and damage to equipment. Switchable Headphones switch back and forth between mono and stereo sound, providing an easy way to eliminate compatibility issues. 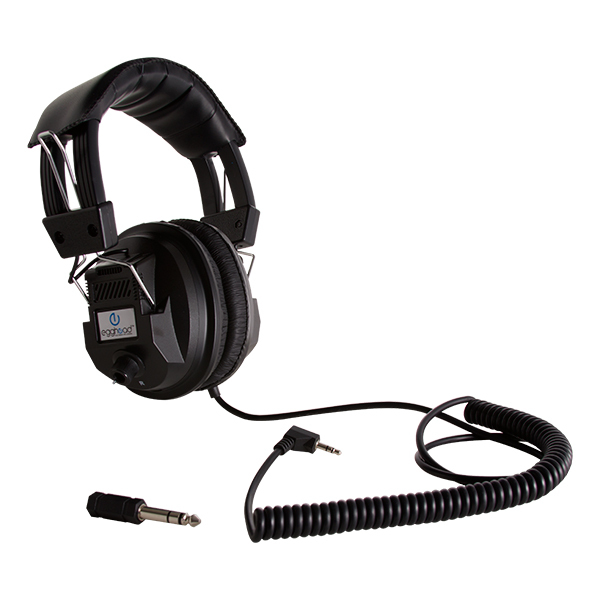 Switchable headphones are available with either a manual or automatic switch. Check your equipment to see if you require mono or stereo headphones. If you are uncertain or will be using your headphones with multiple sources, switchable headphones are your best bet. 1/4" and 3.5mm Plugs - Most headphones have either a 1/4" diameter plug or 3.5mm (1/8") diameter plug. It is important to know which size input your equipment requires, but many headphones come with an adapter that lets you convert your plug from one size to the other. USB Plug - Some headphones feature a USB plug, which connects directly to your computer, eliminating the need for a sound card. Nearly all of our headphones and headsets are compatible with both PC and Mac computers, which will be listed in the specifications as "Computer Compatibility: PC, Mac." This designation includes iMac and eMac computers. However, there are some special cases. Mono headphones aren't compatible with any desktop computers and will only work with older cassette and record players. Most headsets (headphones with attached microphones for two-way audio) have dual plugs, so be sure to check your computer has two 3.5 mm ports before buying. You may also see headsets with "mobile-ready plugs." 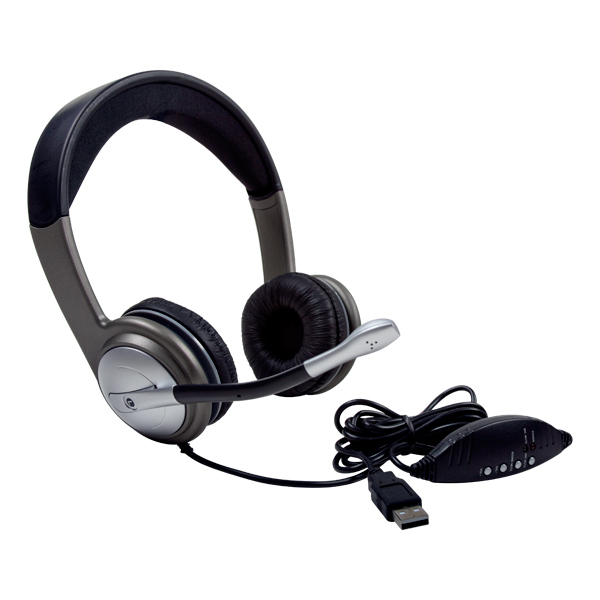 While these headsets are meant for use with Android- and iOS-based mobile devices, they're also compatible with more recent (2012 or newer) desktop computers and Chromebooks. Length - For listening center activities where multiple children are listening at once, use a longer cord. For individual activities, a shorter cord will work. Type - A coiled cord offers more flexibility and generally features straight ends to prevent tangling when multiple headphones are attached to a single source. Coiled cords are preferable for younger children because they are thicker and more durable. Straight cords tend to be a bit longer, but small children will often pick at thinner straight cords. Coiled cords also carry a lower risk of choking for younger students. Durability - Most headphone cords are permanently attached, but some of our headphones feature replaceable cords. A replaceable cord is a good idea in heavy-use situations like computer labs and library media centers where equipment damage is a concern. Frequency – If multiple wireless headphone systems are used in close proximity, make sure that they are on separate radio frequencies. Make sure that any additional wireless headphones you buy are on the same frequency as your transmitter. We offer four different frequencies for you to choose from. Broadcast Distance – This is how far away from the transmitter your students can sit without losing sound. Our wireless headphone transmitters can send lessons up to 100' from the audio source. Charge Time – This tells you how long you will need to charge your headphones between classes and lessons. Make sure you will have time to keep your headphones fully charged. Battery Life – This is how many hours of continuous use you will get out of a fully charged pair of headphones. You'll find many wireless headphones that can be used for up to 40 consecutive hours. A wireless headphone system generally includes a transmitter, 4-6 sets of headphones and a charger, but it's easy to expand your system by adding more headphones and charger units. Adjustability – Make sure that any headphones you purchase fit all of the students who use them. Many of our headphones are designed to fit anyone in the K-12 grade range. Ear Cushions – Ear cushions are usually made of foam, and most are covered with vinyl or leatherette, a manmade, leather-like fabric. Vinyl- and leatherette-covered ear cushions have become more popular with schools because they are easy to clean, decreasing the risk of spreading head lice. Many schools have moved away from sharing headphones altogether, supplying each child with his or her own set. Removable and replaceable ear cushions are available. Volume Control –When multiple students share a single source, as with listening centers, it is important to let them control their own volume. Volume controls are either attached to the cord or located on the side of the ear cup. Some models feature dual volume controls, allowing students to adjust the volume in each ear. Some of our headphones include a boom microphone attached to one of the ear cups. 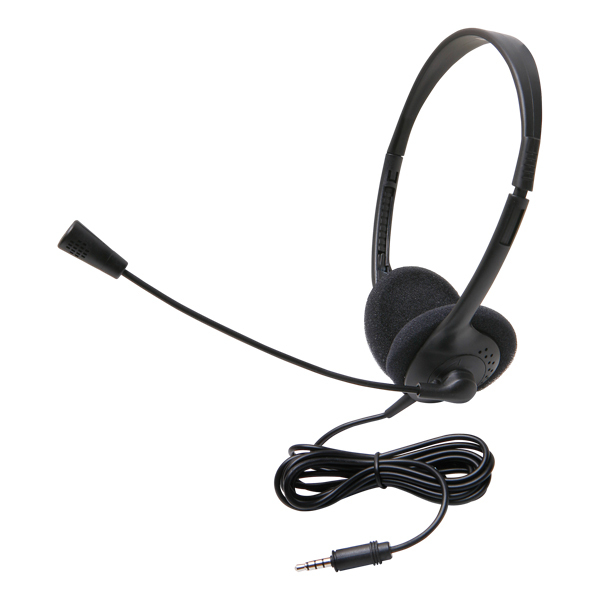 Boom microphones are perfect for card readers, speech classes, foreign language labs and any other learning situations that require spoken responses. Students can speak or read along with lessons, hearing and recording their words as they go. Teachers can track students' individual progress through recorded lessons and provide feedback. View all of our Headphones to shop from our online selection. If you need more information or still can't decide which model is right for your school, call us today at 1-800-260-2776. Our knowledgeable sales team can answer your questions, provide price quotes or help you place an order.